A few weeks ago in the US Ancestry.com offered a weekend of free access to the UK record collection. The last time I noticed one of these offers we were on vacation, so I couldn’t take advantage. This time we were snowed in for a long duration blizzard, so I had lots of time to peruse the collection. Note: If it weren't for social media, I wouldn't have been notified about this sale. Many of my genealogist friends were sharing the post about free access to the UK records on Facebook and Twitter or on their blogs. There was probably an email from Ancestry, but I have a tendency to clear out my e-mail box of advertising without reading any of the unsolicited offers. I almost lost out on this deal! My grandmother was born on 30 September 1897 in Leeds, Yorkshire, England. She, her parents and siblings came to America in 1915 via Ellis Island, traveling in steerage on board the SS Orduna from Liverpool. My cousin and I had already found the passenger lists, which listed the entire family, and my grandmother as a 21 years old. I remember her stories, and her brother and sister’s stories (my great Auntie Hilda and great Uncle Horace). I've written about them HERE and HERE in previous blog posts. And so I began my search for my grandmother’s family roots via the vital records and UK census records on Ancestry. I had used this collection a few years back and had a copy my grandmother’s family listed in the 1901 British Census. Now I could look for them in the 1911 census, and perhaps work backwards in time to previous generations. . 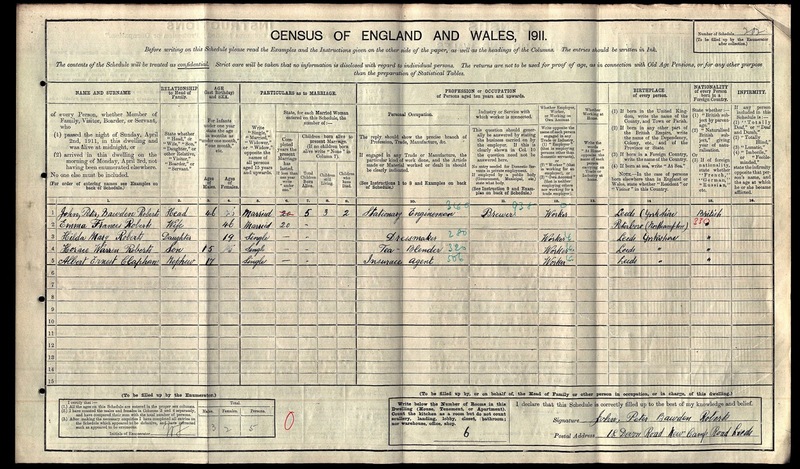 The British census is conducted on years ending in “one”, and online the records are available from 1841 – 1911. 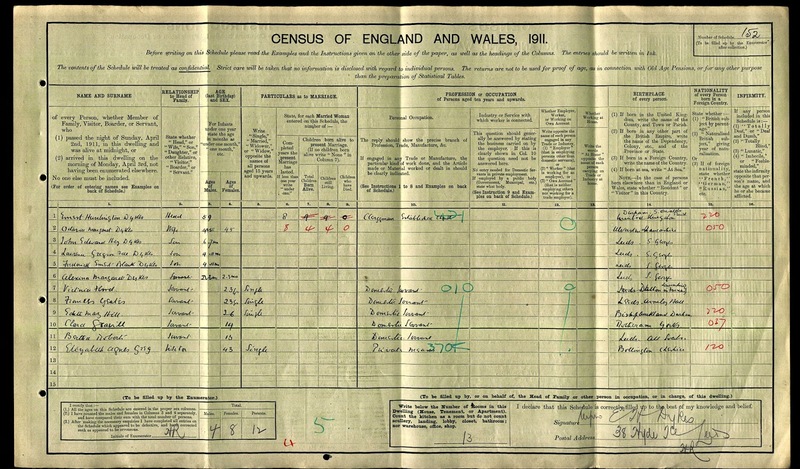 This would be the last British census for the Roberts family before leaving for America in 1915. 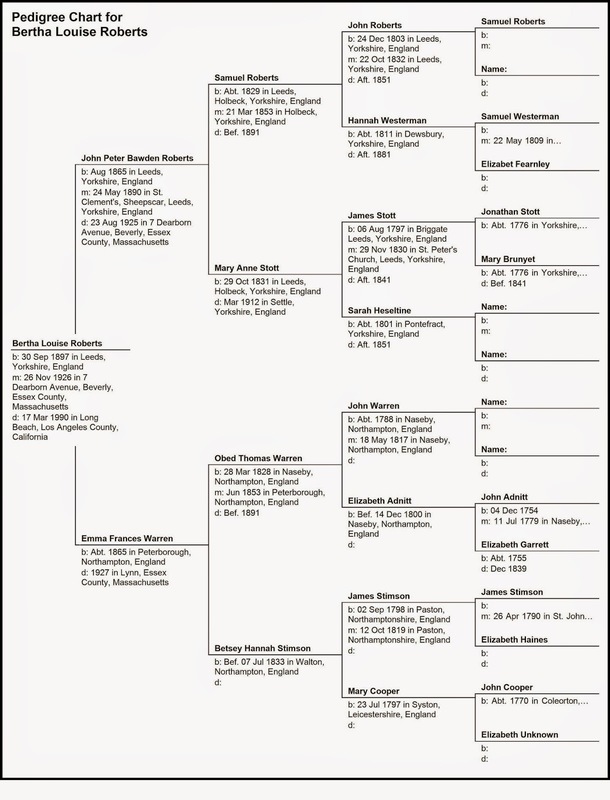 The Ancestry collection was very easy to use, and even though I was working with very commonplace surnames I was able to pinpoint the records easily. Previous to this weekend, my only copy of my great grandparent's marriage record was a photocopy given to me by an uncle. He only had access to an 8" x 12" photo copying machine, so I had never seen the entire certificate before, just a partial view. This was a terrific find for me! Again, I was thrilled to see that these were my great grandparent's signatures! 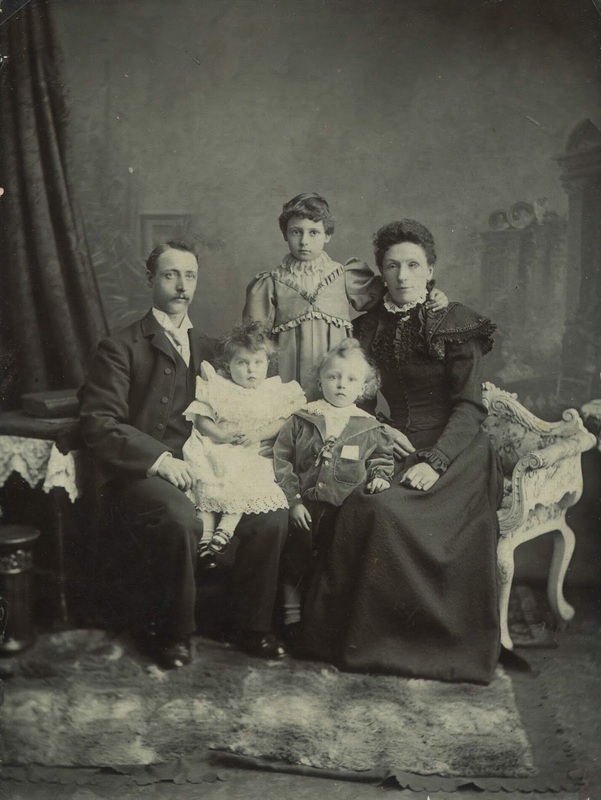 I was not able to trace the Roberts family further back in time, nor the Warren family, but I had very good luck with the Stott family. 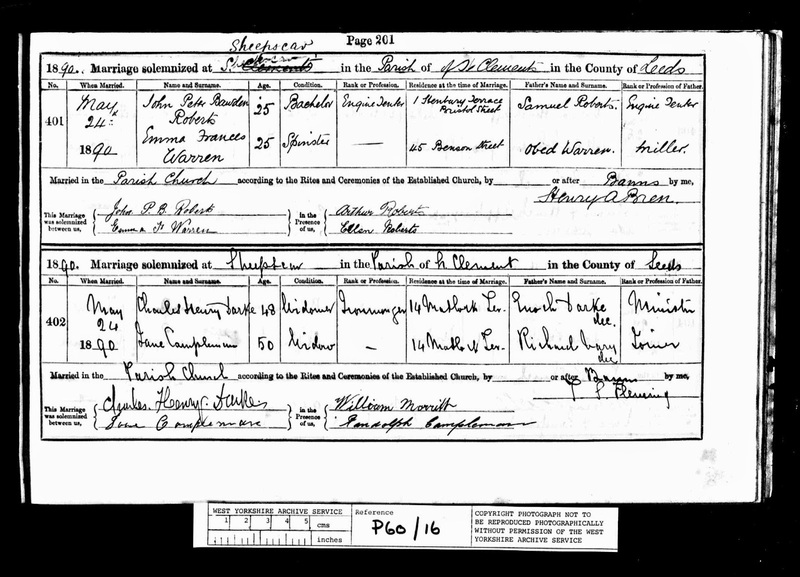 I found the marriage records for Mary Anne Stott's parents, grand parents and great grandparents. 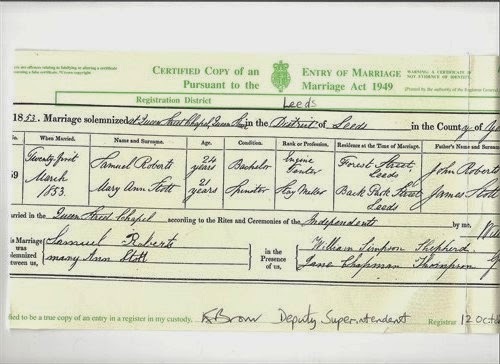 This is the 1796 marriage of Jonathan Stott and Mary Brunyet, my 4th great grandparents, married in Leeds, Yorkshire. "No. 386 Jonathan Stott sawyer of this parish and Mary Brunyet of this parish spinster were married in this church by Banns this twenty ninth Day of September in the Year One Thousand Seven Hundred and ninety six by me Edward Watson, clerk. in the presence of John Hardaker and Tho. Atkinsone"
This was very exciting to me. I have an audio tape made in the 1970s of my uncle interviewing my grandmother about her family in England. Grammy Bertha had forgotten a lot of names, and also had the names of some of her grandparents incorrect. These documents fill in the holes and extend her family back to the late 1700s! And I didn't even have to cross the pond to find these ancestors.